When we first saw GroupShot we knew right away holiday parties would never be the same. Those times that someone jumps up in the background, or a person in front turns their head… not a problem going forward. GroupShot gets rid of the long process of lassoing a person’s face from a photo, inserting it into another photo and matching the edges after resizing and blurring… etc… With GroupShot, if a person has their eyes shut in a shot, let the app do the magic of replacing their face from another shot. If someone runs by in the background in one photo, replace them with blank wall from a second photo. The GroupShot will accept photos you take with the app or you can choose your multiple photos from the iPad’s photo library. Highlight the area you want replaced with the same part from the second photo. 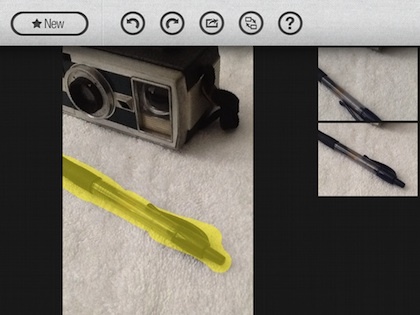 Pinch/expand with two fingers will zoom in on the area you want to highlight. As you highlight, the area of the photo your working on and the second photo will zoom in on the same area on the right. 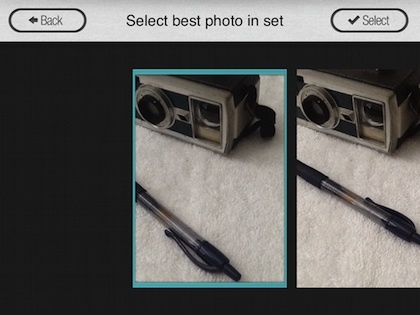 When your done highlighting, tap the second image on the right and GroupShot will pull the area from photo 2 and overwrite the area on the first photo. Highlighting the pen above will replace the area of the pen with the exact area from the second photo. Which is great when taking a couple photos of groups of people. In this case, it was better to highlight the area of the pen and around it a bit more. 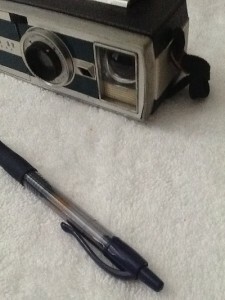 On the left is the pen we want but not the camera. GroupShot auto inserted the pen on the photo with the camera we wanted on the right. 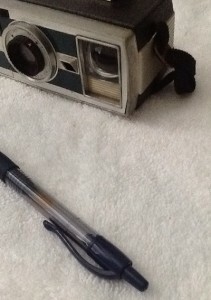 The right photo originally had the pen turned with the pocket clip away from the person taking the photo.